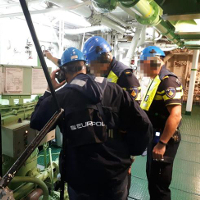 An international law enforcement operation against maritime pollution has revealed hundreds of violations and exposed serious cases of contamination worldwide. Codenamed 30 Days at Sea, the month-long (1 to 31 October) operation saw some 276 law enforcement and environmental agencies across 58 countries detect over 500 offences, including illegal discharges of oil and garbage from vessels, shipbreaking, breaches of ship emissions regulations, and pollution on rivers and land-based runoff to the sea. More than 5,200 inspections have resulted in at least 185 investigations with arrests and prosecutions anticipated. Serious contamination was found in Germany, where a vessel discharged 600 litres of palm oil into the sea. Ghana uncovered gallons of waste oil in large bottles thought to be illegally dumped at sea. Authorities prevented an environmental disaster in Albania by securing waters around a sinking vessel containing some 500 litres of oil. 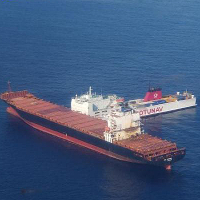 Similarly, the pollution threat resulting from the collision of two ships in French waters was contained thanks to preventive action during the operation. “This is why law enforcement must team up on a global scale to build strong international links with specialised experts so we can tackle this devastating crime while ensuring a healthier, safer planet for all,” responded Wil van Gemert, Deputy Executive Director of Europol, Operations Directorate. Coordinated by INTERPOL’s Environmental Security Programme in close partnership with Europol, 30 Days at Sea was driven by a range of cooperative enforcement actions, involving pre-operational intelligence meetings, with domestic and regional training to strengthen tactical planning and international cooperation. 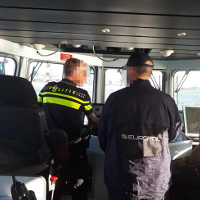 Europol coordinated the actions in the Euro-Mediterranean region including two operational meetings and operational analysis support. In total, 3 323 actions were carried out including 120 prosecuted and 210 pollution incidents detected. A global response – collectively and individually – is an effective way to tackle pollution crime. From 13 November to 13 December, look for the hashtag #PollutionCrime, along with #CleanSeas on Twitter, and retweet to show support in combating marine pollution crime and raise awareness.